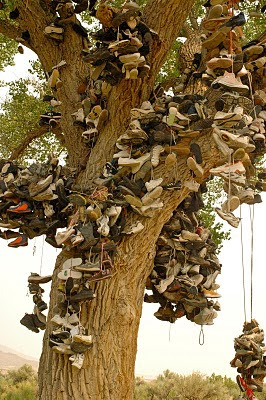 I once visited a place where shoes were nailed to trees. It was very bizarre, to say the least, but incredibly interesting! For the life of me I can't remember where that was! There is an odd beauty to it. All those shoes, all those feet, all the places they've been. I also have to wonder who started the shoe tree and why it caught on. Makes one grateful that trees don't have noses. You know those were not "fresh" shoes.